Coron Island Natural Biotic Area is part of the Tentative list of Philippines in order to qualify for inclusion in the World Heritage List. The property is currently the Philippines' only mixed cultural and natural site in the tentative list, and one that has most potential for inscription. On surface level, most tourists would be quick to compare Coron with El Nido (another property in the tentative list) in terms of natural landscape, beauty and biodiverity. 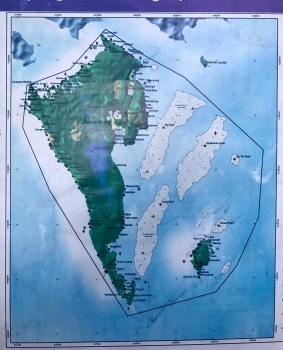 Hence, there is a need to promote how the culture of the Calamian Tagbanuas - the indigenous group living in Coron - is intimately intertwined with landscape and seascape management of the island, its surrounding reefs and islets. See uploaded photo describing the vast expanse of the property. Management-wise, the whole Coron has been declared an ancestral domain for the Tagbanuas, making them able to assert their traditional rights and continue their traditional fishing practices. Many of the areas in Coron are classified as strict protection zones, off-limits to tourists, as they are considered sacred fish sanctuaries for the Tagbanua.